Shortages of mental health professionals in non-metro counties in 2017. 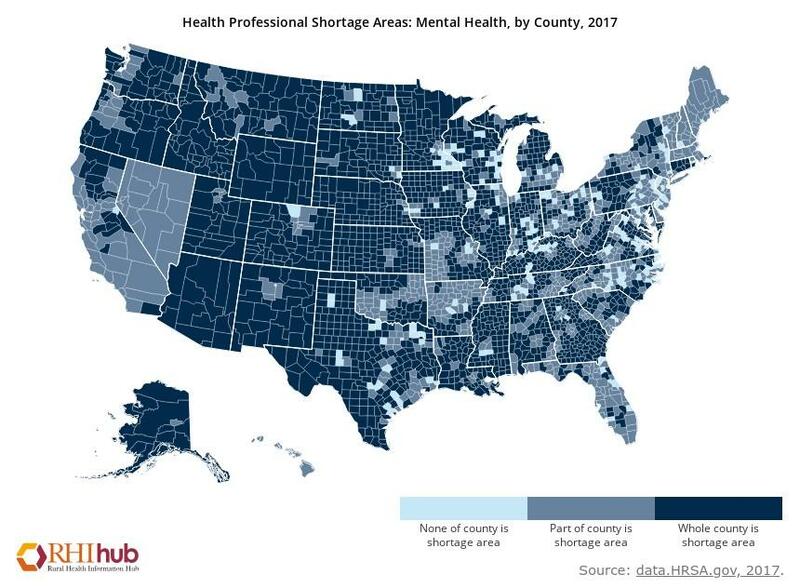 Dark blue indicates the entire county is experiencing a shortage. According to the Centers for Disease Control and Prevention, the Mountain West stands out for its high suicide rates. Montana, Wyoming, Idaho, Utah and Colorado are all within the top ten states for the highest rates of suicide. Martin says there isn’t a single psychiatrist in her six-county region in southern Colorado, and while telehealth may sound like a quick solution, the technology required to conference doctors in remotely is just too expensive. The distribution of primary healthcare professionals is a little better, but Martin says it might be misleading. On the brighter side, rural hospitals in the Mountain West aren’t closing the way they are in other parts of the country. Martin says Medicaid expansion is likely a big factor keeping rural hospitals like hers from sputtering out. According to the Kaiser Family Foundation, Wyoming is the only state in our region that did not expand Medicaid.